After filling all cracks with epoxy and other resins we used a electronic hand planer to flatten both sides. After the slab is flattened we normally run it through our wide belt sander but since the slab exceeded the 44” max width we got out the hand belt sander and got to work. This is a long process since first all the planer marks need to get sanded out and once that happened we go up in sanding grits, from 40 to 120 grit. When we reached the 120 grit we switch to a an orbital sander and work our way up to 220 grit. Now we are ready for lacquering. Often after the first coat we find some more imperfections from the sanding process. So we get our sander back out and work on those areas. Than we apply three more coats to the top and bottom. The last step is to fasten the legs to the slab, making sure the table sits solid on the ground and than it’s ready for it’s new home. 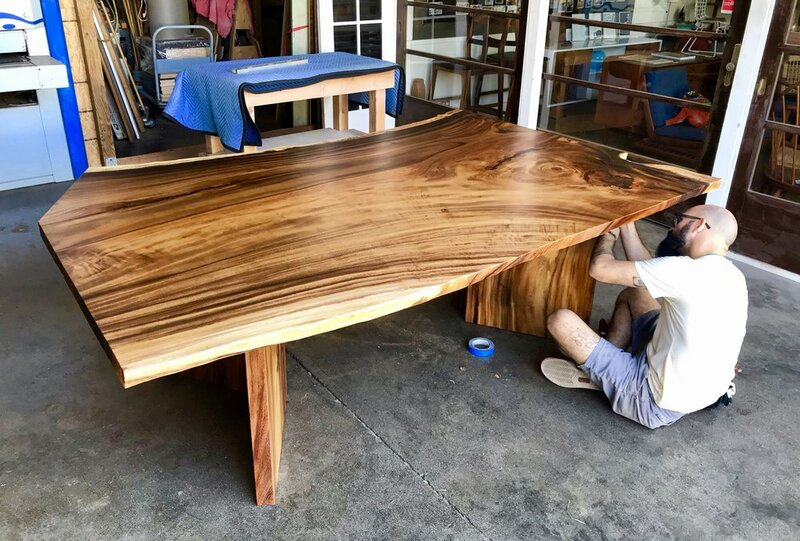 Over the course of the years building many slab table I am still fascinated how every slab has is own characteristics and is beautiful in is own way. I feel like my job is to let the wood take center stage and shine in it’s full potential.